Since the early 1900s, veterinarians have observed intervertebral disc disease—a common cause of back pain, rear limb paralysis and inability to walk—more frequently in dogs with short legs (dachshund, French bulldog, and Pekingese to name a few.) But they couldn't pinpoint why—until now. "Dogs with intervertebral disc disease (IVDD) are 50 times more likely to have this mutation; that's an incredibly strong correlation with disc disease," said Danika Brannasch, a veterinary geneticist and the paper's senior author. "Being able to identify the cause of this painful condition is the first step to alleviating pain and suffering for dogs at greatest risk." "IVDD is the most common neurological condition we deal with in the clinic," Dickinson said. "It's the herniation of those abnormal discs that can lead to paralysis in the worst cases." "The disease cost our clients approximately $1.7 million last year on cases that were severe enough to lead to surgery," Dickinson said. "In addition to the pain and discomfort it causes our patients, it takes an enormous financial and emotional toll on owners." 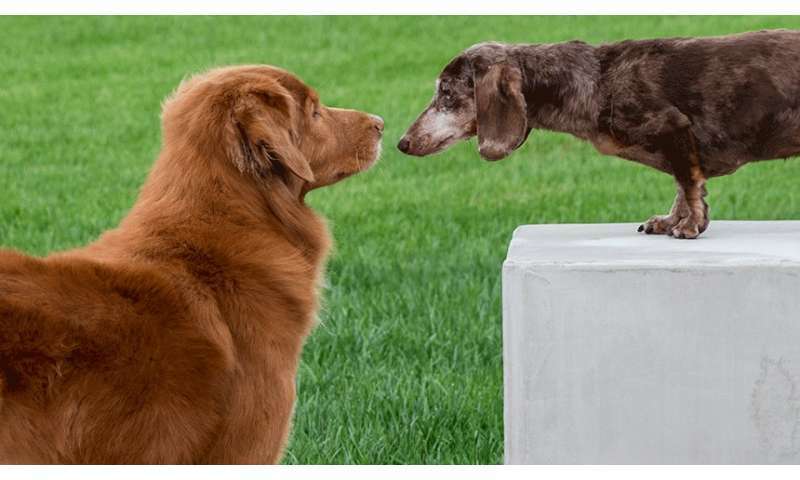 Thanks to an extensive biorepository amassed at the UC Davis veterinary hospital over the past 15 years, Bannasch and her team were able to look at the DNA from cases with IVDD from a variety of dog breeds, which showed the same region was implicated. The hunt for the actual mutation took lots of hard work from DVM/Ph.D. student Emily Brown, who completed her doctoral thesis using this project. At first, the results weren't revealing. It took meticulous combing through the genetic sequence by eye to detect the presence of an FGR4 retrogene insertion. Once Bannasch realized what they had uncovered, she went screaming down the hall with excitement. "It was kind of like looking for a needle in a haystack," she said. "But I knew it was there somewhere." "There's a lot of literature that points to chondrodystrophy in dogs as an exciting animal model for degenerative disc disease in people," said Bannasch, who also holds the Maxine Adler Endowed Chair in Genetics. "Now that we know more about why it's occurring, it might make it a better animal model." "I am a geneticist but I am also a veterinarian and having the ability to eliminate a disease as painful and debilitating as IVDD is the most satisfying result of my scientific career," Bannasch said. "This is what research is all about—reducing pain and suffering in animals." "What we need to know now is the prevalence of this retrogene in all of these breeds," Dickinson said. "Without that, it's difficult to establish how to start breeding the condition out. We need as much information as possible to make a plan and help improve the well-being for dogs who suffer from this condition."